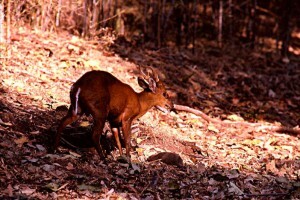 Equipped with tushes as well as antlers, the Muntjac or Barking Deer bridges the gap, in evolutionary terms, between primitive deer like the musk deer and the later cervids. Widely distributed through moist and wet forests across the sub-continent and Asia, its alarm call, a disproportionately loud dog-like bark, is often the first indication of the presence of a predator. 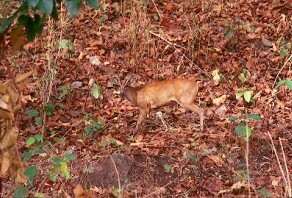 Being small it is even found in restricted bits of forest too modest to support larger deer. Especially in the hills, this is often the type of habitat favoured by leopards and it is here that the Muntjac's vigilance is pressed into service and it's alarm call echoes across the valleys. An ubiquitous presence in the stories of Jim Corbett. A bright chestnut coat with black markings on face and shins. Inside of the thighs, under surface of the tail, lower abdomen, chin and upper portion of the throat are white. Males have short, pronged antlers not exceeding 5 inches, with a long hairy pedicel. 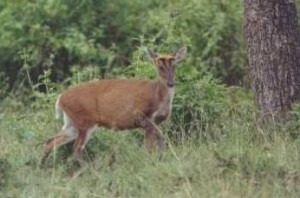 The Muntjac is very widely distributed and is found throughout India, even in the Himalayas upto 6000 feet. Elsewhere in Asia, it is found in Sri Lanka, Burma, Malaysia, Java, Sumatra, Borneo, China and Japan. A shy, solitary creature of forests, which has earned its common name from its alarm call that sounds like the bark of a dog. They love hilly country and are partial to well wooded forests and thick scrub. They come out into forest clearings to graze on the grasses, though their diet primarily consists of leaves and they are quite partial to fruits of the wild ambla (Emblica officianalis), ficus species etc. They are fairly diurnal in habits and a prey species of smaller predators like Leopard (Panthera pardus) and Dhole (Cuon alpinus). A creature of fixed habits and quite dependant on water, they seem to have a territory or fixed area within which they live singly or in pairs. One may occasionally come across a female with two fawns, though one fawn is the norm. Very skittish by nature, they are an extremely nervous highly strung deer that breaks out into paroxysms of anxiety at the slightest provocation, calling in alarm for an extended period of time.